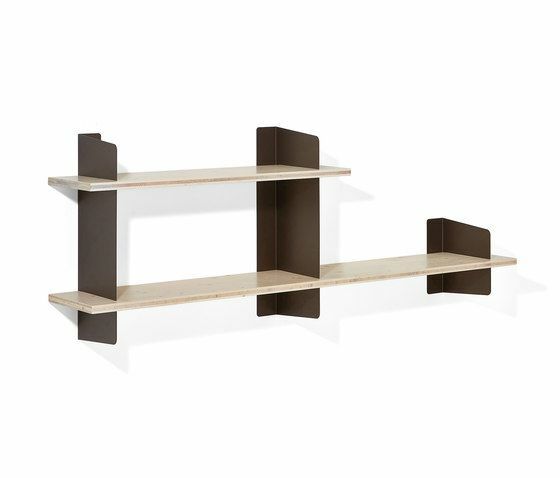 Simple idea, sophisticated product: slant-cut, sheetsteel brackets and wooden shelves are combined to create a versatile and simple piece of furniture. Sophisticated: the mounting screws are covered by the shelves, an unconventional construction detail that underlines the design's two-dimensional aspect. Bringing colour into everyday life: Atelier is available in different lengths and with one shelf or two shelves that can be individually combined and extended by using the metal brackets. Atelier can be used in the living room, in the office, in the guest room or in the children's room. Together with bars and hooks, it can also be used as a kitchen shelf or coat rack. The bars can be slotted into variable positions on the front or back and can thus be used to hang up clothes or to have those kitchen utensils handy. When used in the kitchen, cookbooks can be stored on the top shelf. An acrylic mirror makes for an additional practical and fun feature. The powder-coated sheet steel is available in white, basalt grey and black and in a dark bronze shade. The shelves are available in white melamine-coated particle board or in solid, five-layer plywood (spruce or fir) stained with a small amount of white pigment, or in solid natural or smoked oak.